Buried in paper? HP can help. The 9250c Digital Sender makes it easy to create electronic copies of your paper documents so you can distribute them easily, store them efficiently, and organize them right along with your other electronic files. Increase employee productivity by scanning to e-mail, printer, folder, and fax for communication, archival, and retrieval. 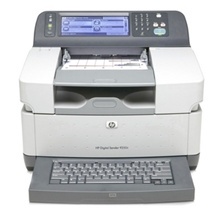 The included HP Digital Sending Software 4.0 (DSS4) enables the scanning to printer function. This dedicated device is designed exclusively for digital sending. Scan documents at up to 33 color and up to 55 black-and-white images per minute. Add indexing data to documents via custom keys. It's easy to use! An intuitive touch screen control panel makes it easy to navigate through digital sending functions. An external and familiar keyboard makes it easier and faster to operate. Process files with Optical Character Recognition (OCR) (with HP DSS4 software) to refine search options. An external USB port allows for additional third party extensibility options. Keep your digital data safe by verifying users and controlling and tracking access. Erase the digital sender's hard drive as necessary for increased data security. Easy to install and manage, an HP Jetdirect print server delivers best-in-class networking capability. Create standard or custom workflows from a centralized administrator module. Create custom menu keys to support specific business processes. Our Technicians are available to answer any hardware questions you may have. Buy with confidence from The Printer Pros! We just bought a 2nd 9250c from The Printer Pros, their tech helped us with set-up. Couldn't be happier with this mdl...we have tried have tried just about every mdl out there and this is definitely the best.